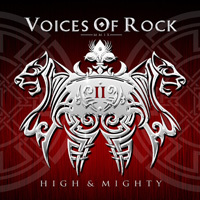 The Voices of Rock project created by Chris Lausmann (Bonfire, Jaded Heart) and Michael Voss (Mad Max, Michael Schenker) offers another plethora of great vocalists: Rob Rock (Driver, Impellitteri, Joshua), Joe Lynn Turner (ex-Deep Purple, ex-Rainbow), Mitch Malloy, David Reece (ex-Accept/Bangalore Choir), Bert Heerink (ex-Vandenberg), Torben Schmidt (Ex-Skagarack), Paul Sabu (Sabu, Only Child), Tony Martin (ex-Black Sabbath, The Cage, Giuntini), Paul Shortino (ex-Quiet Riot/Rough Cutt) and Tony Mills (TNT, Shy) are the chosen ones for the second coming of Voices of Rock. While the first part wasn't a bad effort I thought the magic was missing, which isn't the case on this album. It offers us catchy rockers, up-tempo steamrollers and melodic ballads, some first class vocal performances and a flawless production. Each song seems to be right for the particular vocalist and the diversity in singing styles makes this album versatile and exciting.